What do the demographics behind users who like their Facebook pages say about 23 top automakers? Auto Insurance Center has the answers. According to Auto Insurance Center, seven of the top 10 automakers by Facebook likes were luxury brands, with the top three spots going to Mercedes-Benz, BMW and Ferrari, respectively. However, Auto Insurance Center also found that like totals and sales don’t necessarily line up, noting that first-place Mercedes-Benz sold 330,391 vehicles in 2014, compared with more than 1 million by Jeep, which came in at No. 10 on the likes list. Auto Insurance Center speculated that the disparity between likes and sales was caused by Facebook users liking the luxury brands they dream about while purchasing vehicles that are more practical for their budgets, adding that this trend may reverse soon, as high-end luxury vehicles are the fastest-growing segment in the U.S.
Ford was liked by the most married users. Dodge led among teen drivers, young adults and users involved in the farming industry. Jeep led among white and conservative fans, in the construction and military sectors and among families with children at home. Asian Americans gravitated toward Lexus. Land Rover was the top choice of African Americans. Jaguar boasted the most liberal fans. Tesla was the favorite of the fans with the highest incomes, leading in the business and information-technology industries and among child-free households. Nissan led among graduate students. It really is your grandfather’s Chrysler, as that brand was tops among grandparents. Kia led among Android users. Luxury brand Lamborghini was tops among single users, male users and iPhone users. Female users and those in the healthcare industry gave Fiat the thumbs-up. Readers: Did any of the findings by Auto Insurance Center surprise you? 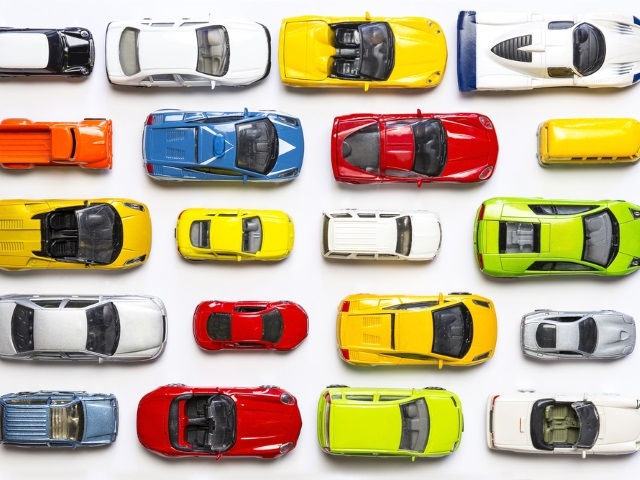 Image of toy cars courtesy of Shutterstock.